Country Homes for rent near Quebec City. Rates from $29 per person per night, for 2-3-5 or 7 nights at maximum occupancy. We offer 25% discount on a 7-night stay or a 50% discount on a third-night stay. 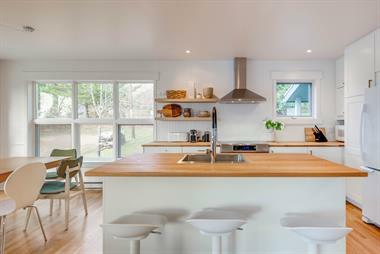 Beautiful large houses, recently built or ancestral, for rent at the foot of Mont-Sainte-Anne, 30 minutes from Old Quebec, the Island of Orleans and Massif of Charlevoix. Well-equipped houses from 4 to 32 bedrooms, 2 to 7 bathrooms which can sleep up to 80 people. A larger house can even accommodate up to 80 people in 32 bedrooms. Double whirlpool bath or sauna and wood burning fireplace in each villa. Access to a large indoor pool nearby. Skiing, hiking, golf, mountain biking, rivers and waterfalls, whales, snowmobiling, snowshoeing, spa nature, massage, in the vicinity. You can visit each of our villas on our website and to get our detailed rates and our availability for the next 2 years. IMPORTANT: For your satisfaction and security, our houses are regularly inspected by the Department of Tourism of the Quebec Government. We maintain, year after year, an international 3-Star level, which means that we have valid insurances for short term rental. This way, you can sleep safely. Pets allowed in some homes only. Free Wi-Fi in ecah house. Price from $29 per person per night for 2-3-5-7 nights at maximum occupancy. 25% discount on a 7-night stay or 50% on a third night.